The Denver Broncos Field / Plaza Level End Zone describes sections throughout the south end of Sports Authority Field at Mile High. The Sports Authority Field at Mile High seating chart shows the Field / Plaza Level End Zone on the first and second level of seating throughout the end zone. Denver Broncos Field / Plaza Level End Zone seats are spread throughout the south end zone on both the Field (first) Level and the Plaza (second) Level of Sports Authority Field. On the Field Level, Field / Plaza Level End Zone seats are in section 129, section 130, section 131, section 132, section 133, section 134, and section 135. On the Plaza Level, Field / Plaza Level End Zone seats are in section 228, section 229, section 230, section 231, section 232, section 233, section 234, section 235, and section 236. All Field / Plaza Level End Zone seats provide a great view of the game when the ball is close to the south end zone. However, whenever the action occurs near the north end zone, fans will have difficulty watching the game from sections so far away. The front rows of sections on the Plaza Level provide a superior viewing experience although the first row of the Field Level is as close to the game as any seats in the stadium. Broncos Field / Plaza Level End Zone tickets are first sold to fans as full season tickets of two preseason games and eight regular season games. After season ticket sales have ended, any remaining tickets are sold as individual game tickets to interested fans. 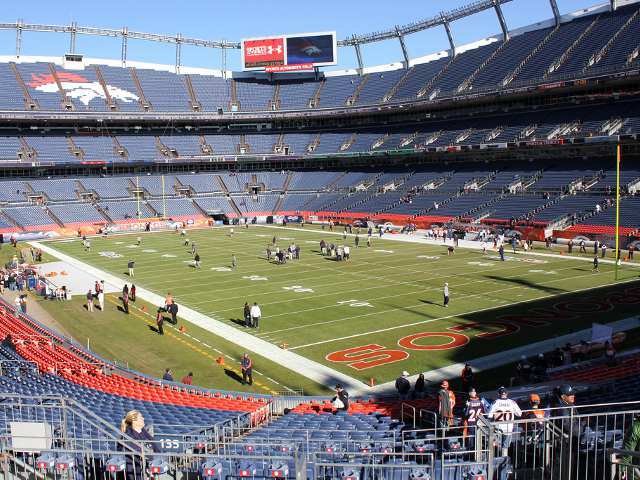 The price of Broncos tickets changes each year, but Field / Plaza Level End Zone tickets are always the cheapest tickets available on the first level of Sports Authority Field at Mile High.